Many people have told me that the mountains to the east of East Dix mountain in the Dix Mountain range of the Adirondacks are spectacular peaks for bushwhack hikes. When I was on East Dix earlier this year, I could see all the open rock summits. I stored that information, knowing the time would come to adventure that area to see what I could find. For the Columbus Day weekend, Leesa and I didn't want to fight crowds on the trails, and we certainly didn't feel like getting up early to claim a coveted parking spot by 6 AM at the popular trailhead parking areas. That's when I reached into the memory banks and pulled out the thought of doing some bushwhack hikes from Route 9 in North Hudson to some of the peaks I had seen from East Dix. On Sunday, we had some company until late morning, then we set out for North Hudson. 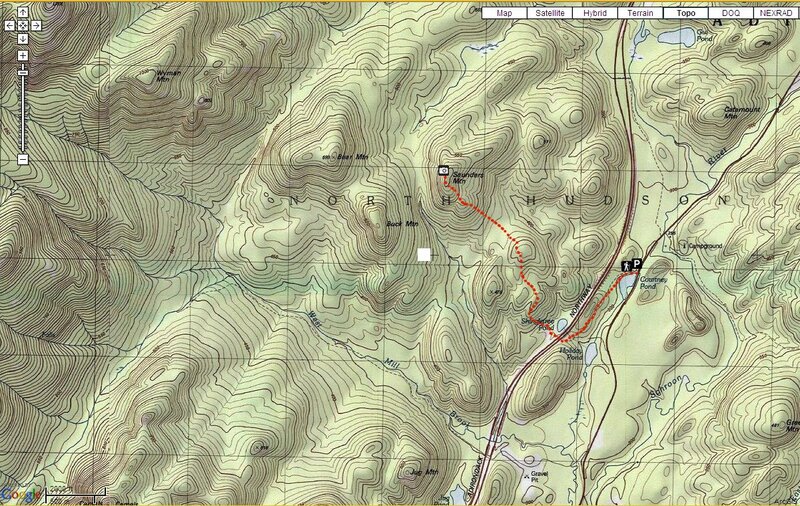 There is a trail head on for Shingletree Pond on Route 9 approximately 15 miles north of Schroon Lake. The trail leads past Courtney Pond and Holiday Pond in the Hammond Pond Wild Forest before going through a culvert under I-87 and entering the Dix Mountain Wilderness. Once on the west side of I-87, the trail ends at Shingletree Pond. 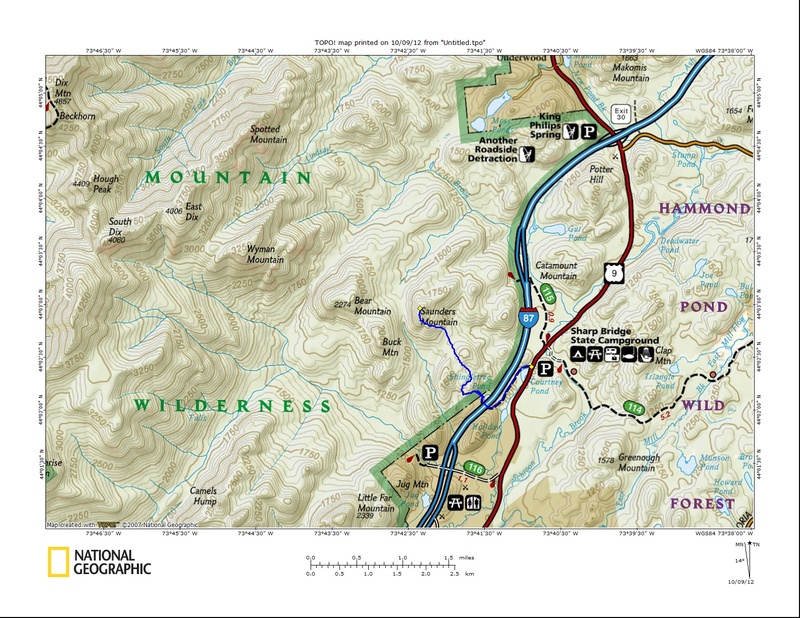 The trail is not too exciting, and there is lots of highway noise, but once the trail ends, the Dix Wilderness begins, and lots of great open peaks are nearby. 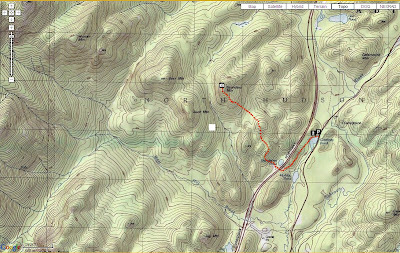 With map & compass in hand and GPS to capture our hiking stats, we set off to find new and interesting peaks. We decided to head for Saunders Mountain first since it was the closest and we didn't know what to expect, or what the terrain would be like. Immediately after heading east into the bush we began climbing past interesting rocks and gained a ridge just above Shingletree Pond that gave us a view eastward. We dropped off the ridge and went through a flat area before beginning the climb up Saunders. The walking was generally easy. The forest growth was generally sparse and a pleasure to walk through. As we made our way up the east face of Saunders, we began to reach rock ledges about halfway up. From there we were on and off the rock several times before reaching the beautiful summit. What a joy to climb. Although the summit is only 1982', you feel much higher. 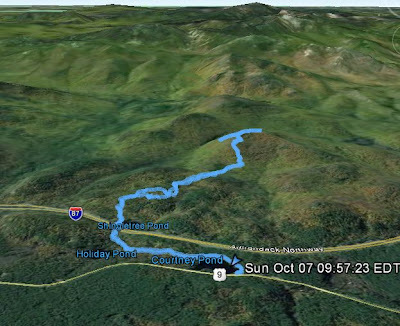 You can see the Dix Range to the west and many of the Vermont Peaks to the East that lie along the Long Trail. Since we had a late start to the day, we couldn't continue on to the other peaks in the area, but that just meant there would be more trips to the area in the future. 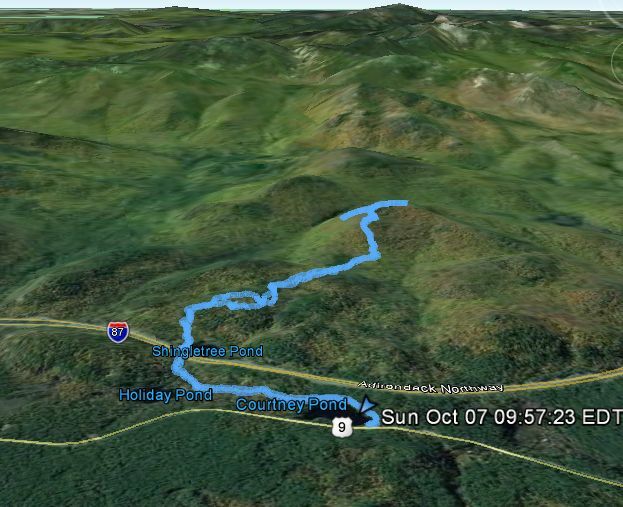 In fact, we came back the next day to head for Wyman Mountain, but that will be a separate post. We will definitely be back to explore and climb Buck, Bear and Spotted Mountains. For now, Saunders is in our memory as a great trip. Looking North from the summit of Saunders Mountain. Giant Mountain and Rocky Peak Ridge in the distance.